Kylie Jenner’s rumoured boyfriend Tyga was handcuffed and cited in Los Angeles Monday. Kylie Jenner’s rumoured boyfriend Tyga was handcuffed and cited in Los Angeles Monday. The 24-year-old rapper was in the South Central area of the city filming a music video for his single Make It Work when the incident occurred. Officer Kim from the Los Angeles Police Department confirmed Tyga was issued a traffic-related citation. "They were shooting a rap video in the area of 76th and Kansas," the LAPD spokesperson told Us Weekly magazine. "LAPD air unit observed a vehicle drive away from that location and observed the vehicle driving recklessly. Los Angeles Police School Police officers conducted a traffic stop at Hoover and Florence where the driver was cited and released, for a traffic violation and the bodyguard was detained for further investigation for an unknown charge." According to TMZ, Tyga was driving a Rolls-Royce down the street with a few other guys in it. Six police cars were called to the scene, which resulted in the musician and his bodyguard being handcuffed against a fence. Ultimately Tyga was released, but the outlet claims the star’s bodyguard was arrested for possessing a gun that is unregistered in the state of California. 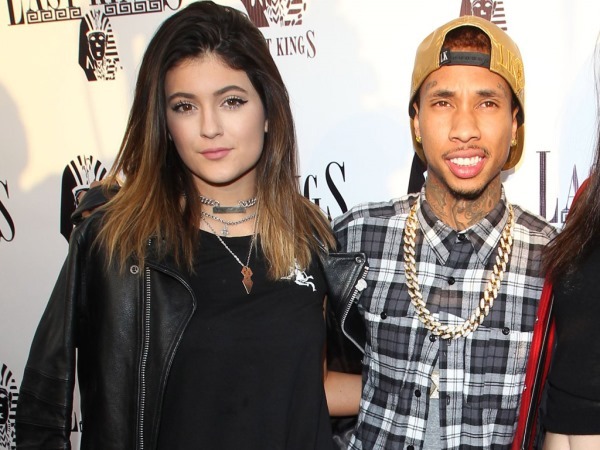 Keeping Up with the Kardashians star Kylie, 17, was first romantically linked with Tyga last month. Romance rumours really started heating up when the pair reportedly visited Europe together near the close of October. Tyga has a baby with ex-fiancée Blac Chyna, who is one of Kim Kardashian’s best friends. It’s claimed Kim is unhappy he’s dating her little sister and she even cropped him out of a group photo posted on her Instagram account which was taken during French Montana’s birthday party over the weekend. Apparently the reality star is convinced Tyga and Kylie are violating “the code” by dating in the wake of his August split with Blac Chyna.